Sara Winge is VP of the O’Reilly Radar group. Since 1994, she’s been crafting the O’Reilly story while in a variety of jobs in Communications. She’s been involved in launching most of O’Reilly’s new initiatives, and, with Tim O’Reilly, co-created Foo Camp in 2003. Her previous jobs, which include furniture refinishing, firefighting, and job counseling, prepared her for working at O’Reilly in non-obvious but crucial ways. In this conversation, Sara talks about Ignite, how it started, and how speakers can prepare to speak at an Ignite event. Geetesh: What is Ignite, and how did this speaking format evolve? Sara: Ignite is a series of community events that offer a unique blend of networking, information, and fun. An Ignite event is an entertaining, high-energy evening of 5-minute presentations by community members who take to the stage to tell the world about their passions and obsessions. Each Ignite presenter speaks in front of 20 slides that auto-advance every 15 seconds–whether they’re ready or not. Presentations are eclectic, to say the least–folks have talked about everything from “The Best Way to Buy a Car” to “Hacking Chocolate” to “19th Century Pneumatic Tubes.” The Ignite motto, “Enlighten us, but make it quick,” captures the spirit of the event. Ignite was started in Seattle in 2006, by Brady Forrest and Bre Pettis. They wanted to create a fun, thought-provoking event for the Seattle tech community that would combine interesting content and socializing/networking. It worked, word spread, and people from other cities asked if they could run their own Ignites. While Ignite was a personal project, Brady and Bre worked for O’Reilly Media, and when the requests got overwhelming, they gave Ignite a new home within O’Reilly. Ignite events are run by volunteers, who register with O’Reilly and post their videos on Igniteshow.com. Ignites have happened in cities across the globe, on every continent except Antarctica. 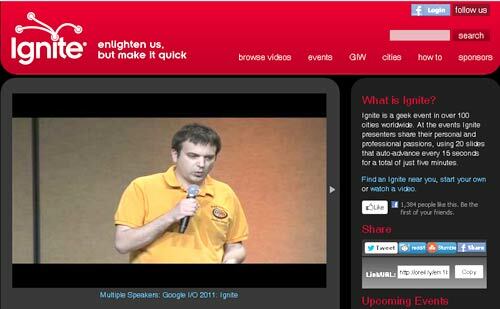 More than 2500 videos from those events (5 minutes each, of course) are online at Igniteshow.com. Geetesh: How do you help speakers prepare for Ignite — also, is there a behind-the-scenes test run before the actual event? Sara: Since each Ignite is run by a volunteer community leader, there’s no standard way to help speakers prepare. But typically, organizers send out guidelines to speakers. Some do hold a pre-event training session or run-through. Watching videos of other Ignite talks on igniteshow.com is a great way for speakers to prepare–you can see what works, and emulate that.